There are too many topics rattling around in my own head today, some are fine and good things, some are ugly and idiotic. What follows is, obviously, the result of what I just said. 1. Big ole' Happy Happy Birthday wishes to one of my favorite places to read and discuss just about everything. Brittney runs the Nashville is Talking blog and it's her consistent effort to provide a wide range of topics to discover, pictures to marvel at, people and things to laugh at, provide a forum for all kinds of viewpoints and she's mighty expert at calling BS when something is just that - BS. Happy B-Day! 2. 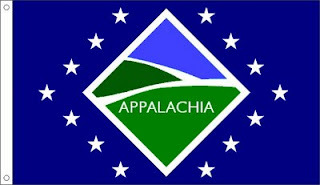 I've recently found another fascinating place to read about all things Appalachian. Hillbilly Savants has a staggering amount of information, links to bajillions of newspaper, television and radio sites, bloggers from across the South, colleges, research and policy groups, a hefty list of contributors and much, much more. Exhaustive work is evident here. The topics cover culture and politics and tall tales of the region, history, science - you name it. I was more than honored to find they linked to this humble but lovable blog, too. How they describe themselves: "This blog is about our Appalachia - the real one, not the Hollywood-stereotype nor the third-world nation-esque stereotype being sold by do-gooders, or even the neo-Romantic sylvan stereotype that Rousseau would probably buy into. It should be interesting." "I don't like being over charged, over taxed, tricked with schemes and lawyers, underpaid, under served, under appreciated, neglected, ignored, belittled, deceived or anything that takes from me without asking in a very real and obvious manner. If a subject takes too much haggle after the fact then it most likely is purely designed to fool the lesser gifted sorts like Jed. I will call them out in my normal "whiney-assed-wish-things-were different" way that is my own. I think that capitalism has reached a plateau in America where some aspects need to be changed to protect workers/consumers from legalistic loophole side stepping. If this sort of thinking makes me a socialist-pinko-commie, then so be it. It doesn't need be another law or ethics committee (we got too many that ain't workin'), it needs to be a matter of known fact, obvious really: take no more than you need from your dealings, examine your needs daily. Do it because you care and want to make a fair place for your babies (or any beloved ones) to live and grow. Turn the soil fine for your land, don't show up for the harvest and leave. Make someplace your real home and it will pay off. It appears to this observer that past superpowers have fallen due to the same mistakes we are seeing/making now. Misplaced goals, it is as simple as that. Invest in people, invest in people because without them there is no market at all. Invest in exploration, because there are things to be found. Our table of elements has some open spaces, one of them might be the solution to unlock the Utopia we all seek. "Lewis' article would be beyond despicable even if it accurately represented the Virginia Tech English department. That it's just another hit piece against an academic department that makes precisely no attempt to characterize that department accurately, that Lewis chooses instead to treat the members of that department as mere instantiations of some "trend" that exists only in his head, and that he does this at a time when the people he uses as political props must be suffering enormously, makes it lower than dirt." Sadly, others too have jumped on the Blamewagon, like the American Family Association, who says the killings were all the fault of "lack of school prayer and video games" - they even have a video to explain it to you. Warning - watching this will induce adverse reactions. I think you'd have to be deeply and truly uneducated to blame the violence in the world today on something that happened since 1950, like comic books, television, video games, or not voting Republican. It's been pretty damn constant in human history that a handful of reasons are at the heart of brutal violence - tribal/ethnic warfare, religion and religious intolerance, treating other humans as possessions, and there are some folk who, as Kurt Vonnegut once said, have some bad wiring in their heads. OK, Now on the topic of the Internet. Yes, yes, I know this post is kind of all over the place. But my brain takes the oddest paths at times. For example. just this morning I woke up from a dream where (no lie) I was making a crowd of French people angry at me because they did not like the way I was imitating the way Maurice Chevalier sang a song called "Louise." In my dream, heck, I sounded pretty good, in my opinion. I have no idea what that was all about. It's not like I spend much time pondering the French. Much less songs by Maurice Chevalier. And how the heck did the lyrics to that song get lodged in my memory? I will admit I watched an old French film by Jean Luc Godard, "Alphaville" the other night, but that had no reference to Maurice Chevalier. Anyway, after I had some time to ponder that dream, I wondered if Maurice or that song had their own piece of the internet to call their own. Naturally, of course they do. Here's a video someone made in appreciation of an actress named Louise Brooks, a silent film star, set to Chevalier's singing. Funny thing too, this video was uploaded just within the last week. PS - I cannot think of Chevalier without thinking of this scene by the Marx Brothers, where they steal Chevalier's passport and all try to pretend to be him. Kewl! Great title Joe! Thanks for the p.r. my home town friend! Thanks for the great write-up - - - we try. And Morristown? Forgettahaboutit - all I can say is multilevel downtown.